It was really a bitter bite to chew for Frankfurt the second place in the Bundesliga, so much so that Prinz and companions have put very little to get the right ransom. From that 13 March, day of the last championship, the Frankfurt meditated revenge (given the second position only one length from the tri-champions of Germany Potsdam) and so it was. In the final of the DFB Pokal, played in Cologne in front of over 20000 spectators, it was the girls from Frankfurt to get the better of the champions of Germany and Europe in charge, thanks to a win for 2 1. A really hard challenge, a sign of the great balance between the two teams lasted the whole season with the end of the Hessian girls who got the better thanks to the winning goal of Garefrekes (48 '), a very fundamental player in the economy of " black "German. For Bajramaj and teammates this time there was nothing to do, despite the goal of Nagasato (41 ') who had rekindled the shots after a start to forget with a goal at 9' Huth. The German Cup returns to Frankfurt for the eighth time with a season that closes in the best way, despite the initial difficulties; conquered national trophy and Europe acquired for the next year, where Prinz and his companions will certainly try to emulate the great ride that in the 2008, brought the German training on the roof of the continent. The girls from the Bundesliga who have worked so hard during the week to better face this 16 championship gioranta will have to wait again. In fact, the 6 games that were scheduled, only 2 were disputed due to the incessant snowfall that seem to have hit much of Germany. 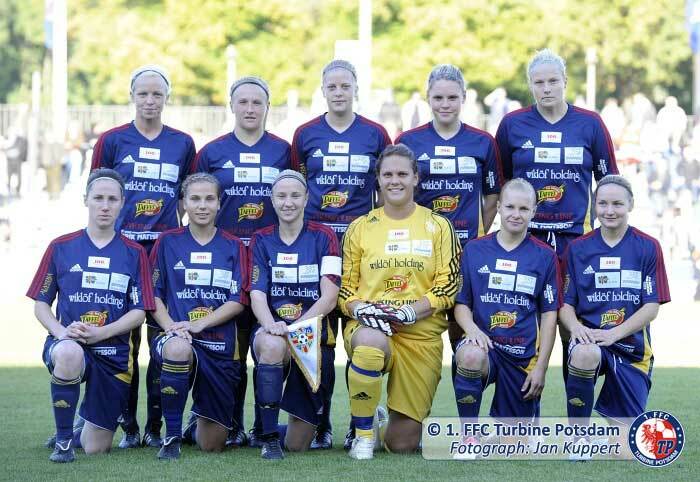 Turbine Potsdam had the chance of the championship and did not miss it. Victory at home against the Wolfsburg opponents, the 4 finalsice match at 0. Great blow this allows the potsdamine to return to the top of the standings. Things get more complicated for FFC Frankfurt who, not having been able to play, must try to stay focused to regain the record. The other game that was played was between Hamburger SV and Saarbrücken. For the 90 minutes of the game, the house-girls who finally impose themselves for 3 to 1 dominate. All the other matches have been postponed and will certainly be recovered during or at the end of the season. The Frankfurt flings into the Bad Neuenahr's house. 8 are the goals that the Frankfurt has trimmed at Bad Neuenahr during this 15 day of the German women's championship. Following the Turbine Potsdam is assured the result with a goal by F. Bajramaj at the 11 minute of play and closes with this result the game. It remains then following the leaders and it is decided to take advantage of every little mistake of the opponents to return the head to the standings. Exciting and full of goals instead the match between Wolfsburg and Bayern Leverkusen. The double of M. Muller seemed to have secured the game for the girls at home. However, during the second half Bayern Leverkusen showed his teeth and, not only did he hang up the result, but took the lead to the 60 'with a goal by S. Thompson who took a smile from the opponents' mouths. The Wolfsburg did not panic and settled the accounts by drawing about 15 minutes from the final whistle. Victory at home for FCR Duisburg dominating Bayern München and remains undisturbed in third place. Black day for USV Jena who lost 1 to 0 at home against Hamburger SV with a goal just on the stroke of 90 '. The meeting between the Saarbrücken and the Essen-Schönebeck is postponed. The match between Frankfurt and Turbine Potsdam arrived on the thirteenth day of the season. This match saw the two strongest and highest teams in the standings oppose a breathtaking match that everyone had been waiting for since the start of the season. The tension was skyrocketing, but the Frankfurt girls were able to keep their nerve until the end and dominated the Turbine Potsdam which took the first defeat of the season! The final result was 4 at 1 for the Frankfurt that ousts the Turbine and leads, with 36 points, leading the German championship! Read more: Escape for victory! And after the fall the penultimate weekend of October, the bundesliga has reopened its doors. The Potsdam Turbine is still in charge, confirming the leadership in the standings and grabs the fourth consecutive victory. Triumph who comes out of the house against the Essen-Schönebeck thanks to the decisive help of the double by A. Mittag. Positive result also for the number one chaser of the leaders, the FFC Frankfurt, which thanks to goals signed by B. Prinz and C. Pohlers remains in full struggle for the Scudetto. Heavy yet another defeat, however, for the Bavarian girls who fail to make the leap and remain relegated to the middle of the standings. Wins for Duisburg, Bad Neuenahr and Wolfsburg close the table in descending order Saarbrücken, USV Jena and Herforder SV.